By Laura Matjusaityte | April 8, 2019. The co-founders of the club (not in order) Vicky Comerford, Charmaine Doab, Nicola Scott, Paula Hickey and Zoe McCormack. 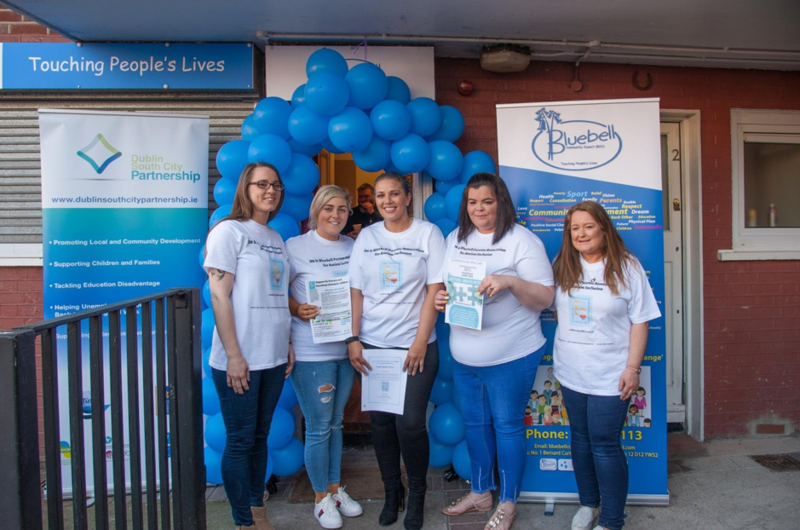 Dublin 8 & Bluebell Parents Association for Autism Inclusion was launched last Friday afternoon, in Bluebell. The group was organised by five mothers, who very well know what it means to raise a child with autism – and decided that sharing their own experiences might be much of help for other parents who find themselves in a similar situation. It all started as a support for one another. Quickly, they noticed that all of them are facing very similar challenges, especially when it comes to their children’s’ education. “We all going through the struggle of trying to secure suitable educational placement for our children and this is what brought us together as a group,” Vicky Comerford, one of the mothers from the group, told the Liberty. Ms Comerford said that coming together and sharing their stories made them realise that not only the education system but also local sports or activity groups are shut down for the people living with autism. The group’s goals are to build a community which will be fully autism-friendly. They strive for an adequate education for autistic children in local schools. They also encourage local clubs to create groups where autistic children could take part in sports and other activities. The women don’t waste time: even before the launch the group together, with St. Patrick’s Athletic FC in Inchicore, created a ‘football for all’ group, to allow children with disabilities to take part in team sports. “Our children and every other autistic child should have an accessible education within their own community,” Ms Comerford said. However, the most important goal for the group is to bring changes to the education system. The group’s doors are open to everyone who wants to join or simply need support or advice from mothers with similar experiences. “We don’t want other parents to feel the isolation that we all felt that comes with being the parent of a child with a disability,” said Ms Comerfold. Open days will be held every Thursday from 10 am to 1 pm at 1 Berard Curtis House in Bluebell. For more information contact the group on their Facebook page D8 & Bluebell Parents Association for Autism Inclusion.